http://www.engvid.com Are you the new student in your English class? Do you understand what your teacher is saying? In this lesson, we will go over some of the vocabulary, expressions, and questions that you might hear in class. What do you say if they are speaking too fast or if you didn't hear? It can be stressful to ask questions, but after this lesson, you will be more confident participating and interacting with your teacher and classmates. Hi. Welcome again to www.engvid.com. I'm Adam. 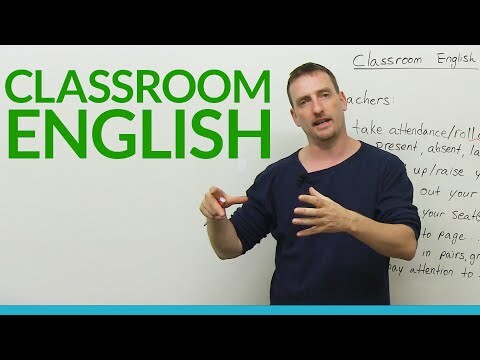 Today's lesson comes as a request, because I know that there are actually quite a few of you who are teachers of English, and you wanted to know some classroom English. So, today, we're going to look at classroom English. This is more for beginners, especially people who have just joined an English class, an ESL class, EFL class, etc. and you're starting to get used to the classroom environment, and you're not exactly sure what the teacher is saying, what you should say, etc. We're going to start with the teachers. What do teachers say that you need to understand? Okay? [Clears throat] Excuse me. First, the teacher will take attendance, or the teacher will take roll call. Sorry, these are two separate words, "roll call". Basically, they want to know who is here and who is not here. Okay? So, if a student is in the class, he or she is present. So, if the teacher says: -"Bill?" -"Present." -"Mary?" -"Present." -"Bueller? Bueller? Bueller?" Bueller is absent. He or she is not in the class. So, "absent", not here. "Present", here. If the teacher has finished with attendance and starts to teach the class, and a student comes in then, that student is late. And they get a little check. Too many lates, you get into trouble. Now, you could be absent, but you can have an excused absent, means that you have a note from your parents, from your doctor, from your boss, or the teacher just knows that you're not coming today and it's okay; it's excused. Now, the teacher will give you commands. He or she will tell you to do things. Okay? So, it's very important that you understand what to do. If a teacher says: "Put up your hand", or: "Raise your hand to ask a question, to make a comment, to ask to go to the bathroom", put up your hand. Raise your hand. Don't speak out. Because if everybody speaks out, it's just noise. Put up your hand, ask your question, get your answer. Okay? Then, the teacher will ask you: "Take out your notebooks. Take out your pens. Take out your earphones." Basically, get them ready, we are going to use them. Okay. "Take your seats." Basically means sit down, sit. Okay? So, he's trying to get organized, or she is trying to get organized. Next, they'll say: "Take out your book. Turn to page 37." Means open your book, page 37, let's start reading, working, etc. Now, if the teacher wants you to do things, but not alone... For example, if you're doing math, yeah, you do it alone no problem. If you're doing ESL, the teacher will want you to work in pairs. It means two people together, so you can speak. "Work in groups", means get into a few people together; three, four, five. If he wants a specific number, he will say: "Get into groups of", or: "Work in groups of three." So, you find your two friends, three sit together, do the exercise. Now, if the teacher... As everybody's talking, the teacher wants everybody be quiet and listen to one student, he will say or she will say: "Please pay attention to Jack. Jack is going to speak. Everybody, please pay attention to Jack." Or if you're doing exercise, if the teacher wants you to be careful about one word or one grammar structure: "Pay attention to the independent clause." Means be very focused, be aware. Okay? So, these are the basic things you need to know what... That your teacher will say. Now, you're the student, you have questions or you don't understand something, what are you going to say or what are you going to ask?